As I mentioned at least 100 years ago when I first started this blog I was working on a competition with amazing prizes and today I am ready to finally unveil it. Basically an update on the old buzz wire game that kids of yore played. Full details can be found on the SEO Buzzer page and the winner gets a review on my blog and an ad for the month in a slot of their choosing. 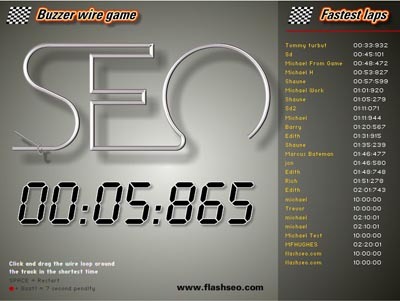 Game was created by Galaxy Graphics who offer customisable and bespoke Flash games for a very reasonable fee. I’d like to thank Michael for putting in the hard work when WordPress wouldn’t display it and then when my database wouldn’t record the scores. The delay in putting this page live is certainly not a reflection of how long it takes them to create a games, which was actually ready 3 days after I ordered it. Please make sure you leave an email address you can be contacted on if you want the prize as I’ll have no other way of getting in touch. Comments are enabled on the page if you want to brag about which fast time is yours or to lament that final 7 second penalty that cost you the win. « Sometimes you just can’t win.